The Men’s Fellowship is led by Brother Ricky Clubersome. The purpose of this fellowship is to build up and strengthen the men in the Word of God and to lead their households as He instructs in His word. 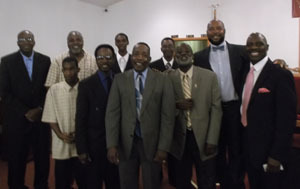 This auxiliary consist of on outreach ministry through which they minister to the young men in the community. The fellowship of this department consists of cookouts, recreational parks, and biblical studies.